From the National Weather Service in Brownsville. 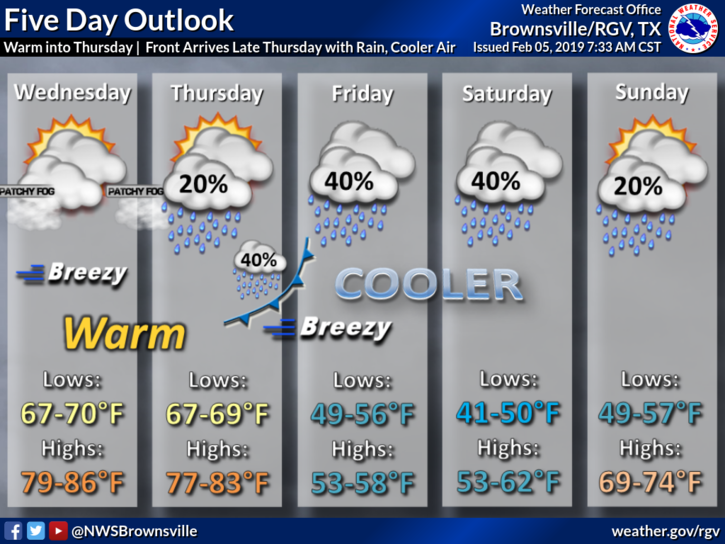 Expect another warm day with partly sunny skies across the Rio Grande Valley on Tuesday, according to the National Weather Service in Brownsville. Rio Grande City is expected to reach a high of 86 while McAllen will be 84. It will be cooler near the coast. The high in Brownsville will be 79, and South Padre Island will be 72. The warming trend will continue through Thursday night, when a cold front is expected to make its way into the region. Highs and lows for Friday will be in the 50s. Lows Saturday will be in the 40s with highs in the 50s. There will also be a 40 percent chance of rain on both Friday and Saturday.